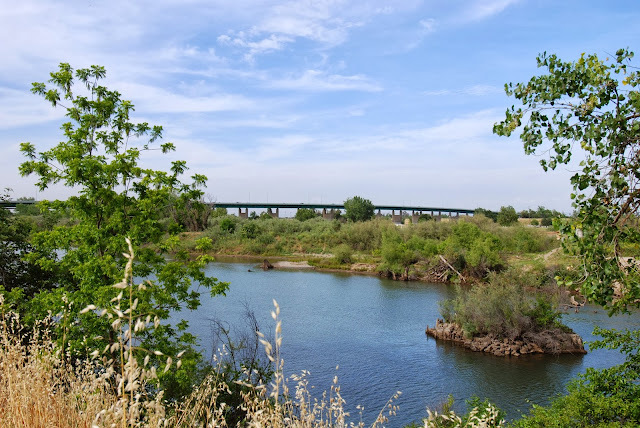 Continuing northward we arrived at the 24-span Feather River Bridge and Overhead (18 0009) a continuous steel girder bridge that carries the Colusa Highway (Route 20) over the river. It was built in 1947 and widened in 1994. The Feather River BOH has a length of 2674 ft including two 160 ft long haunched girder spans across the river. It's 68 ft wide and carries four traffic lanes and sidewalks. The long approach structure is supported on oval columns projecting up from pierwalls. My favorite feature is the delicate pale green railings with twisted vertical elements and wave-like horizontal elements. Yuba County, California Bridges: Colusa Highway (Route 20) Bridge across the Feather River by Mark Yashinsky is licensed under a Creative Commons Attribution-NonCommercial-NoDerivs 3.0 Unported License.